Sumenep located in the east of the island of Madura, which still has the Palace is still maintained until now. 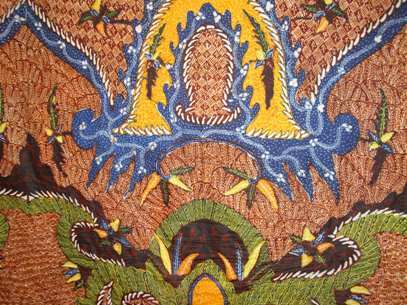 Unlike the Madura batik batik soga sumeneb browned, almost menyerupau batik from the Palace of Mataram. However there is also a dark blue batik, or black and white, but with a little extra green and red hue. Lar plane decorative and is thought to be the effect when Mataram Mataram master Sumenep. 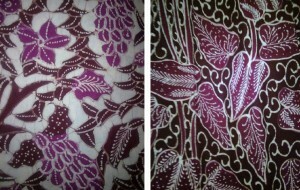 Some examples of batik is: lar, sekar universe, slope, Limar bouquet, carcena hole. Cirebon government under Sunan Gunung Jati is the oldest center of Islamic kingdom in Java and sekaligur an important port in the trade route from Persia, India, Arabia, Europe and China. 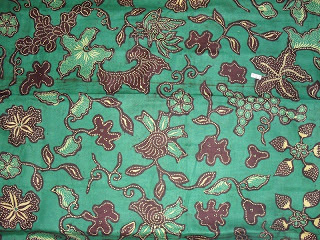 Second karatonnya, namely kasepuhan and Kanoman, produce batik motifs and styles that are not available in other areas. 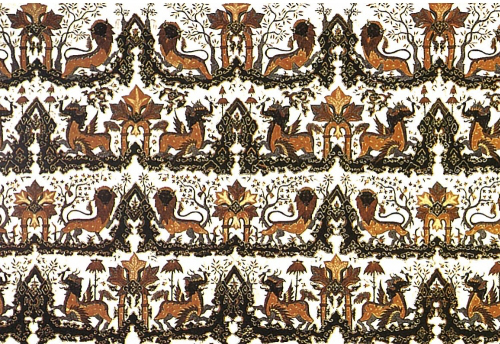 Cirebon batik motif shows the influence of Chinese culture. This is evident in the form of horizontal decking such as decorative painting and walasan the typical mega mega cloudy and Wadasan. Some other examples are batik: batik kasepuhan trains, ships foundered, peksi dragon liman, banner story. At first Pakualaman region is part of the Yogyakarta Sultanate. In 1813 the Sultanate split into Ngayogjakarta Sultanate and the Duchy Pakualaman as a result of a dispute between the Sultanate Palace by British Lieutenant Governor-General Thomas Stamford Raffles. 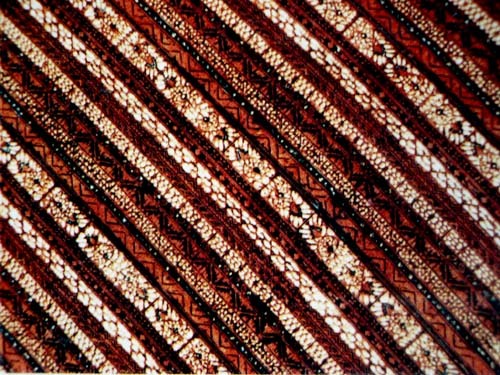 Therefore, cultural elements and motifs of batik has a stout equation. Pakualaman temple motif style changed since Sri Paku Alam VII marry the daughter of His Majesty Sri Pakubowono X. 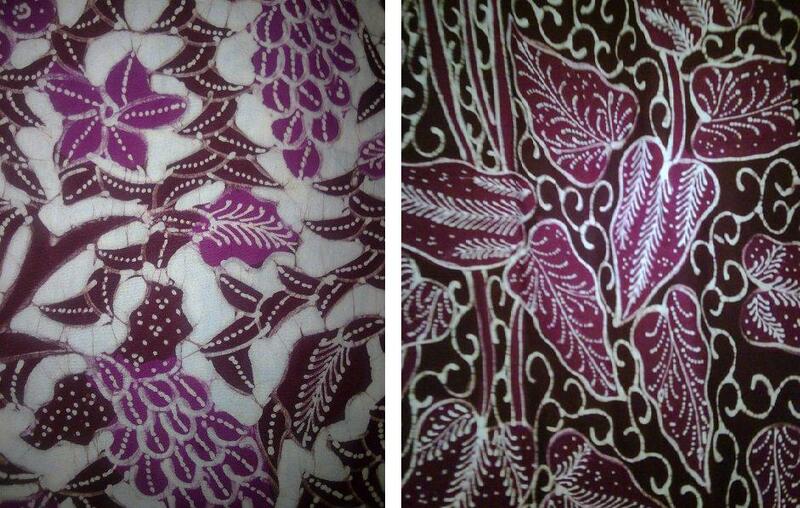 So then Pakualaman motif appear later in the alloy between motif palaces of Yogyakarta and Surakarta batik colors. Pakualaman motif including: temple Varuna, peksi Manyura, alternating scales barong machete, machete klitik seling fried, broken machete alternating huk, plane manak, baboon angrem. 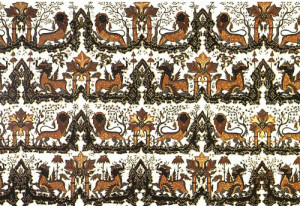 Mangkunegaran style motif similar to the Palace of Surakarta batik, but with a yellowish brown color soga. However batik temple Mangkunegaran step forward in the creation of motifs. This is evident from the many temples Mangkunegaran motif. Mangkunegaran temple motif among others: buketan fern (Bei Madusari mother works), sapanti nata, ole–ole, revelation tumurun, Kesit barong machete, machete sondher, machetes klithik glebag chrysanthemums, lyrical cemeng (Mother works Kanjeng Mangunkusumo). Amangkurat Mas) of Kraton Surakarta. Amangkurat then along the north coast brings followers among batik artisans. Creativity and passion Caroline proved capable of giving the influence to the world of batik Indonesia. 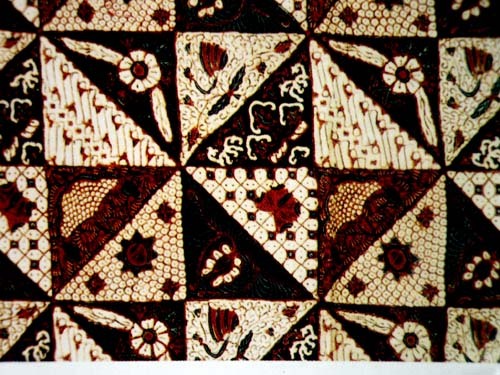 Although Caroline had died, his work still can we enjoy in any tidal development of batik in Indonesia. As said Yves Saint Laurent: “Fashions fade, style is eternal.” Thank you Caroline for something different on Batik Indonesia! is a Chinese-produced batik with patterns and colors influenced by cultural background with batik patterns of Japan Palace. 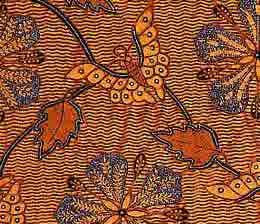 This Batik fabric started to develop during the occupation of Japan in Indonesia. 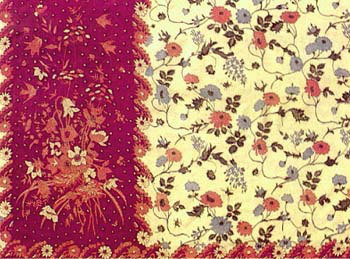 There are the usual motif of batik in Java Hokokai is cherry blossoms, krisant, dahlias and orchids in the form of buketan or lung-lungan and plus a butterfly motif, in addition there is also a motif a Peacock who has a sense of the beauty and grandeur. Java Batik Hokokai created the Chinese entrepreneurs with the aim of adjusting to Japan’s Government. The name Hokokai is derived from the name of the Java organiosasi that help Japan activities create prosperity in Asia in a variety of activities in collaboration with the people of Java. One of its activities ordered batik Pekalongan to entrepreneurs and given to the people of Indonesia who contributed in Japan. 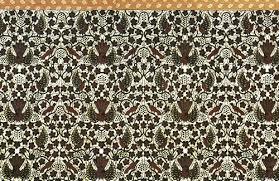 One of structuring motif very clearly shows the influence of Japan is part of a pattern called Susomoyo that is a fringe pattern consists of a range of ornamental flowers and butterflies that are set from the corner towards the bottom corner towards the bottom or the side such as the stacking pattern kimono. Batik Banyumas is a folk craft products of the textile industry which had a distinctive motif Banyumas and so one type or pattern of Javanese Batik Banyumas Batik production center is in Sokaraja, Banyumas. Batik Banyumas now rada Dim due to losing a matter of management (especially business management) with another period of batik batik Banyumas jaya is circa 1965-an nganti 1970s. This pattern contains the meaning of fortitude and must hold through life are concerned when hit by the rain and heat. Preclude a person, let alone a newlywed, should be bold and willing to live are concerned when many hindrances and trials. Proverbial rain and heat, they fear may not be easy to complain. All hindrances and obstacles that had to be faced and solved together. Husband or wife is living in the household. If one is faced with a problem, then the partner should help resolve instead of just adding to the problem. For example, when a husband is being got seduced by the temptations of other women, then she should be able to find a solution and seek the wise resolution of problems. Vice versa, if she got the lure of another man, the husband must be discerning without having to put an excessive suspicion before the found evidence. There is a belief that if a sick person is using this as a blanket of cloth, so it will heal faster. Clamp that is adding to the excitement of the day. With a new spirit that’s expected new hope will emerge so that healing is easy to come by. In addition, with the presence of the penjenguk, expected the pain doesn’t feel left out and have a great desire to recover so relatives getting bigger.